Andrew S. Dance & Associates, LLC, (ASD) is a planning and landscape architecture consulting firm based in Palm Coast, Florida. ASD is owned and operated by Andy Dance, past Florida Chapter ASLA President and Trustee and the current elected Flagler County School Board chairman. Please take a moment to browse this site and become familiar with the work of a professional landscape architect. Thank you for visiting! Andrew S. Dance & Associates, LLC has quietly become one of the premier providers of quality landscape architecture services in North Florida. The firm was founded in 2008 with the vision of providing superior service and value to clients, while at the same time demonstrating environmental stewardship and natural resource conservation principles in every project. It is our belief that this vision will not only enhance the community we serve, but also result in high quality projects for our clients. Click the palm logo to the right for more information. Sept. 21, 2010 - The Palm Coast City Council granted Florida Hospital Flagler their request to change its long-term land-use plan at its 100-acre campus on State Road 100, including permission to exceed height and density limits and, possibly, install large electronic sign at its main entrance, even though city code prohibits such signs. The City of Palm Coast planning board previously approved a development master plan for Florida Hospital Flagler on August 18th that would allow an additional 100 beds, 179,000 square feet of hospital and medical-office space, a 16,000 square-foot restaurant and a 75,000 square foot hotel on tracts immediately abutting SR100. Currently, the hospital campus contains 310,000 square feet of existing medical space stretched over 30 acres near the intersection of US Hwy 100 and Interstate 95. Future development would take in an additional 40 acres, with 20% of the overall tract remaining in conservation. 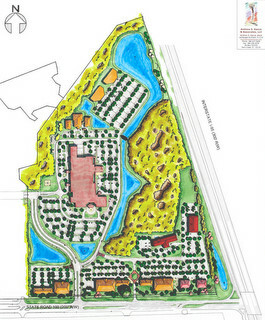 Andrew S. Dance & Associates was hired by Florida Hospital - Flagler to prepare the artistic site plan renderings/presentations and the typical landscape buffer plans proposed along Hwy 100 and I-95. Read more about the proposal HERE and HERE. Andrew S. Dance & Associates, LLC is a proud member of the American Society of Landscape Architects.